Gaskets consist of a wide variety of seals or packings, used between matched machine parts or around pipe joints to prevent the escape of a gas or fluid. 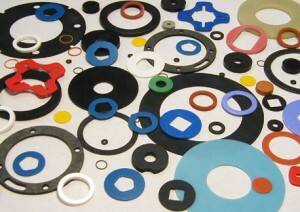 The Rubber Consortium produces the highest quality gaskets in many varieties of these materials: Nitrile, EPDM, Neoprene, Silicone and Fluoroelastomer as well as many other custom compounds. Contact us today for a quotation at info@therubberconsortium.com or submit a request for a quote here.